These two photos above are of the same coyote taken one month apart. 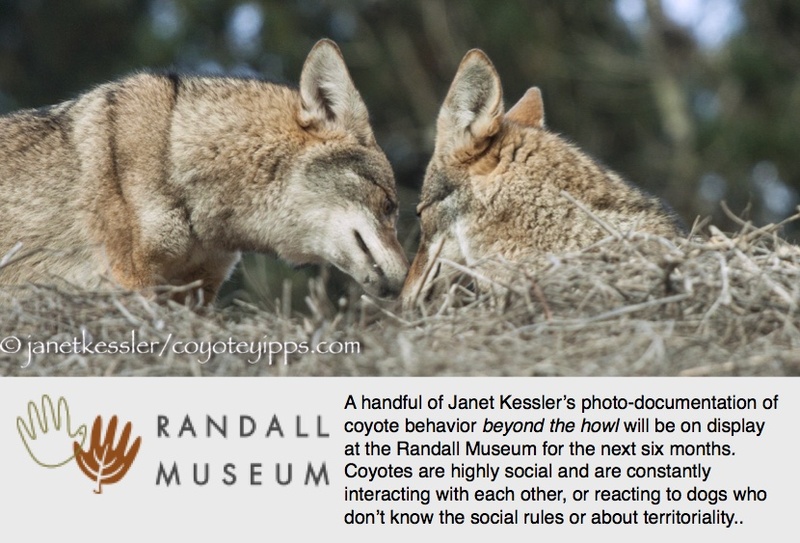 During the Summer, photo on the right, coyotes retain a lighter-colored short undercoat which remains in place throughout the summer until it becomes buried by the longer winter, protective and weather-resistant coat with the markings, which comes in during the Fall. Coyotes have a signature winter coat (photo above left and below left) usually has a crescent of black and white hairs — looking a little like a shawl — which can be seen over the upper back right below the shoulders. Each coyote sports a variation of this marking which can vary slightly in size, intensity of colors and color combination. Look at the variations of winter coats in the first photo to the left below. The entire winter coat is amazingly thick and long — over 4″ — and and includes a very bushy tail, as seen in the full coat below. The same coyote urinating in the photo below, has a summer coat for the most part, but she hasn’t totally shed the winter coat which is still on her lower back where she hasn’t been able to reach with her claws: coyotes help the shedding process by scratching. Part Summer & part Winter coat!